As Green Week continues I thought I would look for some home decor projects that you could do that would be recycling items you may already have around the house. Last week I wrote about how you can use carboard to make a wreath for any occassion. Here are a few DIY home decor blogs that I found that have some fantastic ideas that I am going to be keeping in mind. 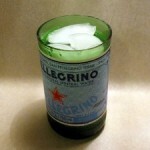 The Go Green Blog has a really clever idea on how to recycle glass bottles. This is an adults only project as it requires tools and precision. Impress your guest with a cool glass with a very cool label. These will bring up some get conversation. Coffee filter are fairly cheap to buy so why not make something with them. The Nester has come up with a great coffee filter wreath and tree. She makes it look so easy and they turned out so beautiful. I never would have thought coffee filter could look so good. I am a candle freak but sometime I don’t know what to do when the wick runs out yet there is tons of wax left. Maie Dae has a great suggestion as to what to do with leftover candles. Candles are expensive so get your monies worth. This has to be the coolest thing I have even seen. The end result doesn’t look like they are spoons. DIY Crafts To Make has so many good ideas like this awesome hanging lamp. I am for sure bookmarking this for a later return. Are you crafy? Do you do a lot of DIY around your house? If so, leave us a message below so we can check you out. Also, Bond With Karla is looking for guest bloggers who are crafty and DIY their home so if your intersted contact me. I am always looking for cool green crafts! Nice to find out you post about crafts too. I love those coffee filter ideas. So cool.